For smaller pressure cookers use a 15 cm / 6-inch spring-form cake pan. (Measure the diameter of your pressure cooker to be sure). Cotton twine or other piece of strong string – 2 pieces each 4 times the width of the pan. This will help to create a handle. Prepare the cake pan, parchment paper ‘lid’ and string according to the instructions above. (Watch the video for visual instructions). If you are baking the cake, preheat the oven at 180C / 350F. Peel the pears and remove the bottom part. Rub them with a slice of lemon to prevent browning. In a measuring jug, place the milk and vinegar. Leave the mixture to stand for a few minutes. Meanwhile, in a large mixing bowl, mix all the dry ingredients together. In the measuring jug, add the rest of the wet ingredients and stir well. Make a well in the centre of the dry ingredients and pour the wet ingredients. Mix to incorporate all the ingredients into a smooth batter. Do not whisk or over-mix this mixture. Place both pieces of string under the prepared spring-form pan, centre of strings matching centre of pan. Insert the pears into the batter until they are almost touching the bottom but leave a little bit of batter underneath them. Cover the pan with the parchment paper 'lid' and tie the strings around the pan to make a handle (as shown in the video). Place a steamer rack in the pressure with 2 cups of water. For stovetop pressure cooker: Add one extra cup of water. Gently lower the cake tin onto the rack and leave the string in there. Turn the valve to the closed position. Set the settings on manual, maximum pressure for 38 minutes. Press the start button and let the pressure cooker do its magic. For stovetop pressure cooker: Steam for 38 minutes as from the first whistle. After the time is up, let the pressure go down naturally, i.e. do not quick release it. This will take about 20 - 25 minutes. Once the red indication is down in the 'safe to open' position, open the pressure cooker. Grab the strings and remove the cake tin. Remove the parchment paper lid. 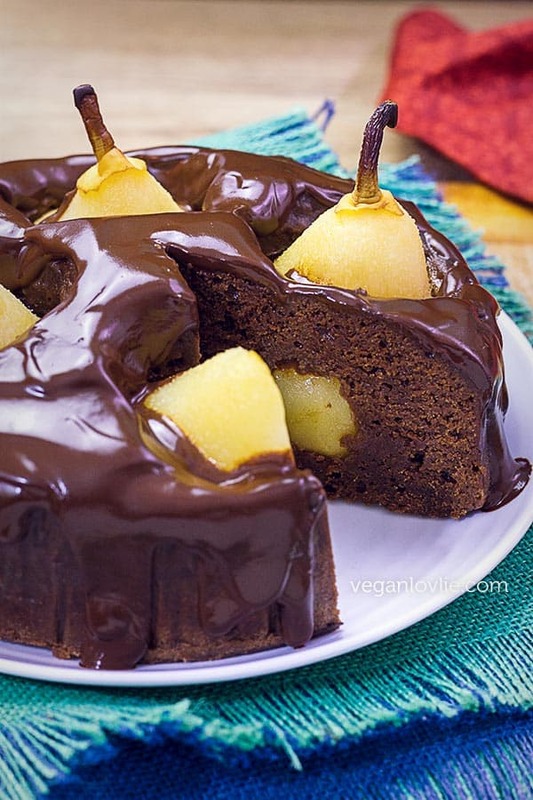 Test for doneness by inserting a skewer in the middle of the cake away from the pears. It should come out clean with just a few crumbs but no batter. Allow the cake to cool completely before demoulding. Baking instructions: Bake in a preheated oven at 180C / 350F for 40 - 45 minutes or until a skewer inserted in the middle comes out clean. Make a double boiler by placing some water in a saucepan with a bowl on top. Break the chocolate into the bowl. When the chocolate starts to melt, stir a few times until all is melted and smooth. Remove the bowl from the saucepan and add the milk a little at a time while continuously stirring. You should get a smooth thick chocolate sauce with a dripping consistency but not runny. Drizzle or spread the chocolate ganache on the cake using a spoon or spatula. You can smooth it out around the edge if you wish but I like the irregular drippings. To serve make sure to cut half a pear with each slice of cake. This cake will keep in the refrigerator for 3 - 4 days and it is even tastier the next day. You may serve it cold or warm with a scoop of ice cream. *If you wish to cover the whole cake with chocolate, use 100 g. For a light drizzle, 50 g should be enough. Adjust the amount of milk required accordingly. **If you have a stovetop pressure cooker, add 1 more cup of water. For steamer pot, keep adding water as required.